We would appreciate it if you take a few moments and let us know of your travel experience with Hidden Trails. Just fill out the Trip Report below and click the Submit button. 1. How did you first hear about Hidden Trails? 2. How do you rate the following ? 4. What bothered you the most? 5. Did you have the right expectations and were they fulfilled? 6. Will you participate in another riding tour in the near future? 7. Do you plan to travel with Hidden trails again? 8. Will you recommend Hidden Trails to your friends? 9. Do you own your own horse? 10. May we use you as a reference for other travelers? 11. 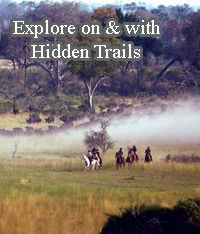 Would you like to receive Hidden Trails "Specials" by e-mail? © 2005 Hidden Trails, Ltd. All rights reserved.